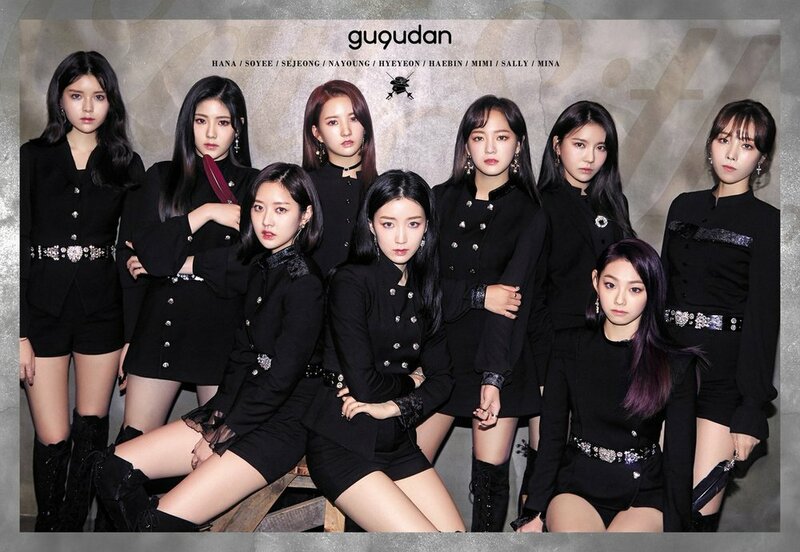 Just around two months after gugudan wrapped up their promotions for their latest single album, the group made a quick comeback with a more mature look and sound with the mysterious “The Boots.” As Act. 3 Chococo Factory received an unexpectedly lukewarm response from the public late last year, the group is aiming to reach greater heights with their comeback single album Act. 4 Cait Sith. “The Boots” is gugudan’s most appealing title track to date. Compared to its predecessor “Chococo,” it’s a lot more charismatic, hence being more appealing even on the first listen. One thing the two title tracks share in common, however, is their unpredictability in structure. A few beat and rhythm changes prior to the choruses, in addition to the interesting mix of minor and major chord progressions, provide a lot of entertaining switch-ups that prevent the song from being predictable. The song’s arrangement is very trendy, as it has a great amount of tropical house in it, especially in the chorus. However, they incorporate an ample amount of hip-sounding percussion samples as well as organic sounds like the guitar and the sax. The best feature of the track lies around the audibility of the variations written into the melodies of the track. The way the intensity of the melodies changes in certain parts of the track is engaging, especially in the final line before each chorus, where it’s entirely different from the melody the previous lines prepare you for. In addition to a song full of attitude, the music video for “The Boots” is also the group’s strongest effort to date. While it doesn’t go the comical route with its execution, the visuals utilize a great amount of black with a hint of white and neon colors at certain moments of the video. The choreography, which the group has said they intensely paid attention to, is also their strongest, with a nice touch of a dance break pre-bridge led by Sally and Hana. Much like Act. 3 Chococo Factory, the group’s latest single album houses two additional tracks which are both different from the title track’s approach. The first B-side, “Silly,” sounds like a track that comes from their first mini-album as it stays with the bright pop style all throughout. While it isn’t as captivating as the group’s previous B-sides, it still boasts a nicely-written chorus, which works perfectly with the disco rhythm built behind. The more superior B-side is “Lovesick,” the obligatory R&B ballad of the release. There’s a Spanish guitar that stays low-key throughout, which gives the track the sentimental push it needs to work with the soothing harmonies in it. The vocal capacities of the girls are greatly showcased by the track, especially during the vocal runs the vocalists do from time to time. The track delivers with its catchy chorus, with the “baby, baby” lines that are nicely layered with harmonies that thicken its sound. After the sub-par results Act. 3 Chococo Factory was met with, gugudan made a nice save with Cait Sith. Packed with their best title track and music video to date, as well as possibly their best B-side, the group has set a higher bar for their releases. As the darker concept fits them more than their usual bubbly characters, one could only hope that this isn’t the last we’ve seen of a more mature gugudan. Who knows, “Jelpi” might be listening. Josh is our resident girl group fanboy. When he isn’t writing for The Kraze, he’s too busy watching Nine Muses and WJSN videos. He has a passion for music production and loves making making mash-ups, being the mastermind behind SHIMMixes.